If you follow my Instagram feed, you know that I've just come back from Poland. As halal food is not widely available, I go vegetarian when I visit. Oh yeah, we throw some fish in sometimes. It's relatively easy, as we stay in my family home, so it's home cooking most of the time, and even if we eat out there are plenty of vegetarian options available. First up is the vegetarian 'lard' (smalec). In Poland, and probably other countries of Central Europe, soft lard spread on bread is quite a popular thing. I never quite got it, spreading pure fat on slice of bread ;) When I first saw the advert for the veggie option, I still wasn't convinced. Then I was visiting friends one day, and one of them had it, so I had a taste - it was delicious! If I visit a Polish shop, I always look for it, but with no luck. When I visited Poland this time, I also couldn't find it. I guess it's not that popular - when my mum asked shop assistant in a supermarket whether we can actually find it, she didn't know what we meant and sent us to the meat counter (even though mum specifically said vegetarian). Luckily I found these last two packs in the corner of the fridge - top one with onion and apple, and the bottom one with mixed herbs. Haven't tried the latter yet, but the onion&apple one is delightful! Another thing I was really pleased to find, was the vegetarian paté. Paté is a bit of a childhood flavour for me, I remember constantly eating it spread on slices of fresh bread. Whenever I visit any of the supermarkets that has a Polish food shelf, I come across the brand we always used to have at home, and I really fancy getting some. I tried finding some halal paté, but with no luck (maybe someone can point me in the right direction?). 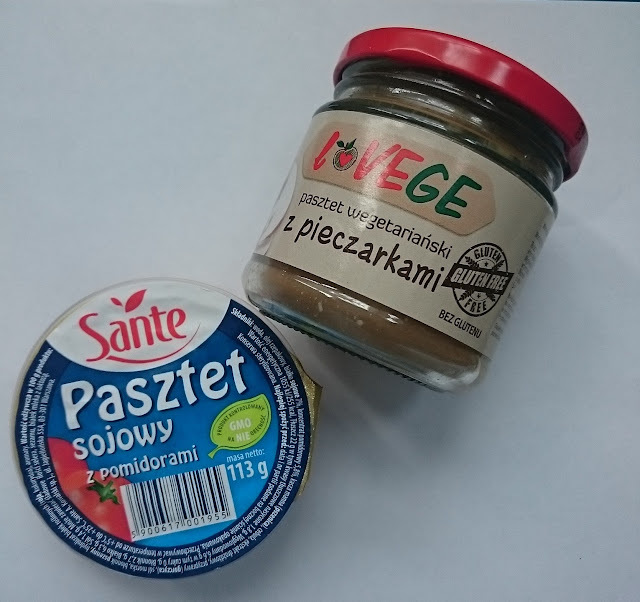 Anyway, when I came across the tomato flavoured soya paté in one of the stores during my visit in Poland, I had to get it! It actually tastes pretty similar to the regular stuff, so I'll definitely be checking my local Polish shops for it. During a trip to a supermarket I also found the mushroom paté (one in the jar), and as mushroom lover I'm already a fan of this too. Though i live in a muslim country but still it was a worth a read and added to my knowledge. I haven't seen the pate yet, but the 'lard' is definitely available in Polish shops. I've never understood the lard fascination either, but the way you describe the veggie lard has made me curious to taste it! wow this was very informative. Having a food blog, I need to know more about what if available and what isn't in different countries in different parts of the world. Thank you for sharing, I actually have a small following from Poland, I wanted to know do you have spice shops that sell Indian spices, or in supermarkets do you get sauces like peri peri sauce or dry spices?? Good to hear that you at last got the HalalAlternatives. I love experimenting with foods, recipes and ingredients from different cultures. Would surely fancy these. first time I am hearing about vegetable lard but I will def try it though. I like pate on toast, one day I must make it again. I will have to find specialty stores for these goodies. The lard kinda through me off, but the vegetarian option sounds appealing. I do appreciate that retailers are keen on provided more vegetariian and vegan options.